BLADEN COUNTY, NC (WECT) - The North Carolina State Board of Elections will hold a hearing in December to investigate potential “irregularities” with absentee by mail ballot envelopes in Bladen County which has delayed the board’s decision to finalize the results of a close U.S. House race in the 9th Congressional District. The state elections board met in closed session for three hours on Friday and voted 7-2 to conduct an investigative hearing before Dec. 21 over claims of “numerous irregularities and concerted fraudulent activities related to absentee by mail ballots and potentially other matters.” The state board did not finalize the congressional race. Republican Mark Harris leads Democrat Dan McCready by 900 votes out of 283,000 cast in the 9th District′s eight counties. Harris won Bladen County by 1,557 votes. Harris responded Friday on Twitter to the reports of voter fraud in the race. His post was called into question by Nate Silver, a statistician who analyzes elections and polls and who writes a blog on elections, politics, sports, science and the economy. An attorney for the North Carolina Democratic Party sent a letter Thursday requesting a public hearing regarding allegations of the voter irregularities. The letter from the Democratic Party included five affidavits from voters and election workers in the county. Some said they were approached by a woman who asked voters to hand over their signed absentee ballots for her to finish filling out and send them to be tabulated. Datesha Montgomery, who submitted one of the affidavits, told WECT on Friday that a woman came to her house in October and asked if she could get Montgomery’s absentee ballot. Montgomery agreed and said she had yet to fill it out. The woman told Montgomery to fill it out and she would submit it for her. Montgomery later found out her ballot was never submitted by the woman and she was forced to go vote in person. Dwight Sheppard, a fire inspector in Bladen County who also submitted one of the affidavits, told WECT Friday morning he believes McRae Dowless is at the center of the alleged irregularities and claims the woman, who he identified as Lisa Britt, works for Dowless. “In the past, Mr. Dowless has always manipulated the absentee ballots,” Sheppard said during a phone interview. The state board of elections eventually dismissed Dowless' protest, citing "a lack of substantial evidence of a violation of election law or other irregularity or misconduct sufficient to cast doubt on the results of the election.” The board did vote unanimously to pass its findings to the US Attorney in Raleigh to determine if any criminal activity occurred. Sheppard said for this election cycle he decided to get more involved and take a deeper look into the voting issues in the county. “One thing I found out was happening was that a lot of people were receiving absentee ballots that were not requesting them. To me, this kind of raised a red flag,” Sheppard said. Sheppard also claimed residents told him that a woman, who he believes was Britt, was visiting homes of primarily black voters to pick up absentee ballots and that she was “successful.” Sheppard claims those ballots were destroyed and never counted. Sheppard submitted a photo to WECT of a woman he claims is Britt. When presented with the photo, Montgomery confirmed that the woman in the picture was the same woman who showed up at her home asking about her absentee ballot. After working with a local group, Sheppard said he was able to identify and get into contact with some of the voters, securing affidavits from them which he passed along to authorities. “I wanted to make it known that this is going on in Bladen County and we need somebody down here to give us a hand and really find out what is going on and get to the bottom of this,” Sheppard said. Sheppard claims Dowless worked for the campaigns of Mark Harris and Bladen County Sheriff Jim McVicker. When reached by phone Friday afternoon, McVicker admitted that Dowless did work for his campaign but denied that Dowless engaged in any fraudulent activity. McVicker added that anyone accusing him of any wrongdoing similar to what has been alleged should “reconsider doing that." Herman Dunn, of Fayetteville, also submitted an affidavit claiming he saw Dowless outside Gray’s Creek Elementary in Hope Mills on April 25 during early voting for the May primary elections. Dunn struck up a conversation with Dowless who said he was there doing absentee ballot work for the Harris and McVicker campaigns. “(Dowless) also stated that, ‘You know, I don’t take checks. They have to pay me cash,’” Dunn alleges in his affidavit. Dunn said Dowless had more than 80 people working for him on the Harris campaign between Cumberland County and Charlotte. Harris narrowly defeated incumbent Congressman Robert Pettinger in the May primary by 828 votes to secure the Republican nomination in November’s general election for the 9th District. Harris won Bladen County by 900 votes. Pettinger spoke with Spectrum News in Raleigh on Thursday about the irregularities in Bladen County. “We’re fully aware of it. There are some pretty unsavory people out there, particularly in Bladen County, and I didn’t have anything to do with them. Let me just leave it at that," Pettinger said. Dr. Michael Bitzer, a professor of politics and history at Catawba College, took a closer look at the irregularities in a post on his Old North State Politics blog. He noted Bladen County saw 22 percent of its requested absentee ballots come from the “by mail” method, the highest of the eight counties in the 9th Congressional District. Bitzer also found 61 percent of the accepted absentee by mail ballots went Republican. He posted a graph showing the accepted absentee by mail numbers from the eight counties. 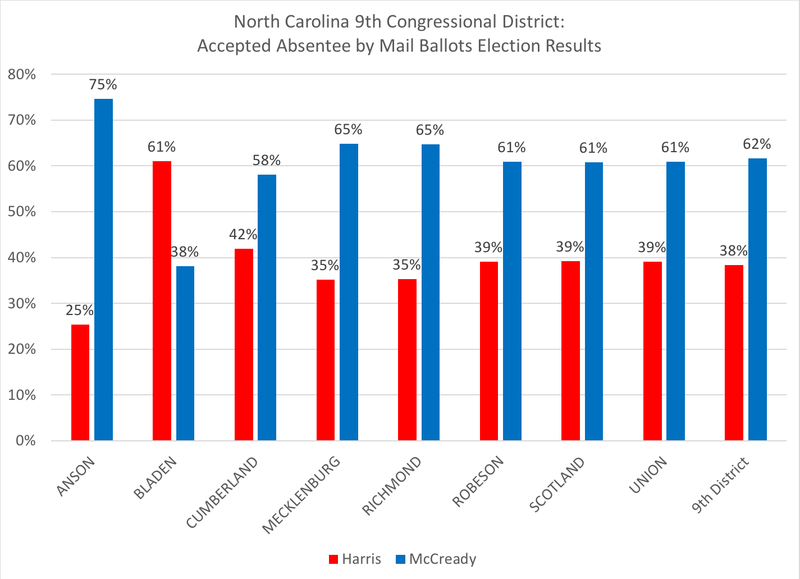 Joshua Malcolm, the vice chairman of the North Carolina State Board of Elections who lives in the 9th District, made the initial motion on Tuesday to delay certifying the congressional race between Harris and McCready. Bobby Ludlum, who is chairman of the Bladen County Board of Elections and Dowless' cousin, confirmed Wednesday the state board’s chief investigator, Joan Fleming, seized the absentee ballot envelopes from the county board’s Elizabethtown offices the day after the Nov. 6 elections. Ludlum was unsure how many envelopes were taken and what the state board is specifically investigating. Copyright 2018 WECT. All rights reserved. The Associated Press contributed to this report.